Mac Sculpture,Superior designs of handmade Sculptured Art Forms. MAC Sculpture offers superior designs of Sculptured Art that are handmade using fiberglass, natural stone, iron works, resin and wax. Mac Sculpture designs are acquired from among several designers with whom they work closely from concept to production and final finish. Mac Sculpture,Superior designs of handmade Sculptured Art Forms. Size: 6 inch Diameter. Sculptured Art. - Serpentine Sphere. Mac Sculpture Superior designs of handmade Sculptured Art Forms. Size: 6 inch Diameter. Serpentine Sphere II Brown and Gold Leaf. Mac Sculpture Superior designs of handmade Sculptured Art Forms. Size: 4Dia inches. Serpentine Sphere I - Gold Leaf. Mac Sculpture Superior designs of handmade Sculptured Art Forms. Sculptured Art Table Piece. Himeros Silver Leaf Male Torso Figure. Size in inches: 16 x 8 x 19 High. Mac Sculpture Superior designs of handmade Sculptured Art Forms. Sculptured Art. 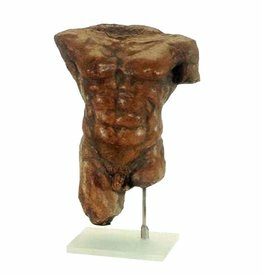 Goliath Aged terracotta male torso Figure. Size in inches: 12 x 9 x 17 High. Mac Sculpture Superior designs of handmade Sculptured Art Forms. Sculptured Art Table Accessory Brown and Gold Leaf. Size in inches: 25 x 12 x 9. By Mac Sculpture Superior designs of handmade Sculptured Art Forms. Sculpted Art Figurines and Accessories. Silver Leaf Frog Prince Figurine. Silver w Gold Accents. Size in inches: 4 x 3. Mac Sculpture Superior designs of handmade Sculptured Art Forms.